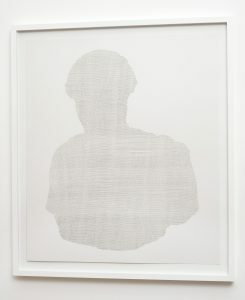 Installation view # 1. 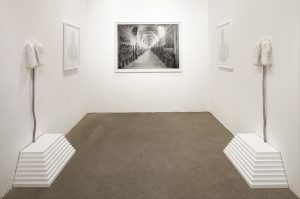 Technique: Digital print, drawings, sculptures with Bipap machines and artificials lungs. Installation view # 2. 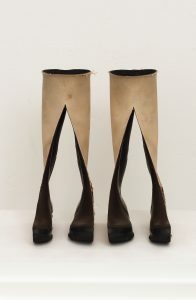 Technique: Drawing, sculpture with Bipap machine and artificial lungs, sculpture made of rubber boots. Size: H 100 cm x W 80 cm. Technique: Pencil drawing. Division leads to multiplication (2012). Size: H 38 cm x W 30 cm x D 30 cm. 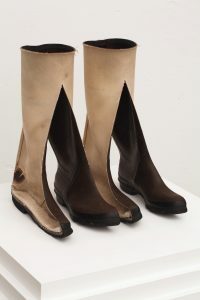 Technique: Sculpture made of rubber boots. Video: Strategie ohne Strategie (2012). Size: H 2 m x W 2,75 m. Duration: 2 min 45 sec. Tecnique: Video projection in Full HD without sound. Video documentation: Synchronous # II (2012). Sculptures with Bipap machines and artificials lungs. In the installation entitled Strategie ohne Strategie reference is made to civilizations that have disappeared, to the fall of an empire, to the cycle of human history and to the concept of tactic or strategy (a factor that characterises both victory and defeat). 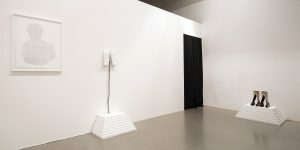 Throughout the installation there is a continuous presence of two poles: on the one hand, for example, we find an external surface, a hard and unchanging “shell” or “housing” in contrast to the presence of the constant alteration and the continuous movement which has its origin inside the form itself. The exhibition space is divided in two: in the first room we find three works of art whereas a video is projected in the second. • The ones who survived: An enlargement (ca. 1,3 x 1,7 metres) of an old photograph that shows a very long corridor of a glyptothek along the walls of which are aligned myriad busts and sculptures. These create a row of majestic guardians of the long passageway which the photograph shows in an accentuated perspective towards a distant exit. • Synchronous I and Synchronous II: This is a work of art made up of two drawings and two sculptures which almost act as custodians flanking the large photograph mentioned above. 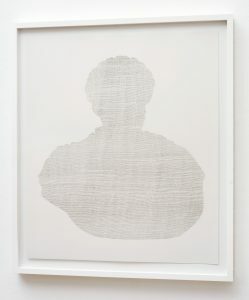 The two framed drawings – which both measure approximately 100 x 80 cm – each show a contour of the bust of a Roman emperor. Hung next to each of the drawings is a pair of artificial lungs that calmly breathe, each run by a so-called Bipap machine. The two Bipap machines are individually hidden inside two pedestals. The visitor can see that the two pairs of artificial lungs breathe slowly and in an alternating way, with a continuous rhythm in which the sound of the breathing recalls that of two persons in the middle of sleep. • Strategie ohne Strategie: The room is a space in complete darkness with a loop video projection of 2 x 2,75 metres approx. The Full HD video is without sound. The projection shows a metal horse that slowly rotates. is not visible at first but as soon as it leavens enough it raises the upper part of the horse. In this way an opening is created on the horizontal plane of the horse and gradually the hidden dough moves beyond the perimeter that contains it and the fissure opens. The boundary of the initially unchangeable space – in this case the form of the metal horse – is expanded due to the pressure from the rising dough. a body in decline where the form changes precisely because what is hidden comes out from the perimeter which ought to have contained it. The soft and malleable matter manages to dilate the volume of the metal horse. The video clearly refers to the myth of the Trojan horse.